This entry was posted in Uncategorized and tagged Art, jars, journaling, red, stamps, watercolor. Bookmark the permalink. The red jar seems to be the only jar that is exactly half empty. The red could represent a pessimistic view of life – anger at feeling unfulfilled ? I’m very curious to know your meaning. Thanks for your interest in my journal page. 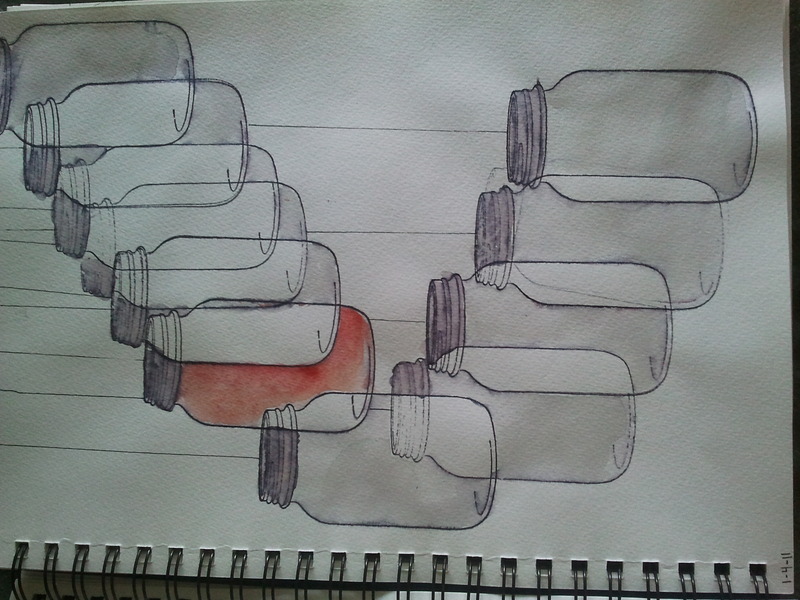 This page represents how everyone (the jars) are the same…hanging in a row. And there is one red jar (me) seeking its place in the world. Not necessarily to become famous or rich, but to show the passion of art to those who don’t see it as important. Interesting. It almost as if you’re thinking that everyone has found their place but you?